This vanilla coffee cake is tender and moist, with a delicious gooey cinnamon swirl in the middle. For us, outside the US, when we hear coffee cake, we think of a cake flavored with some coffee. 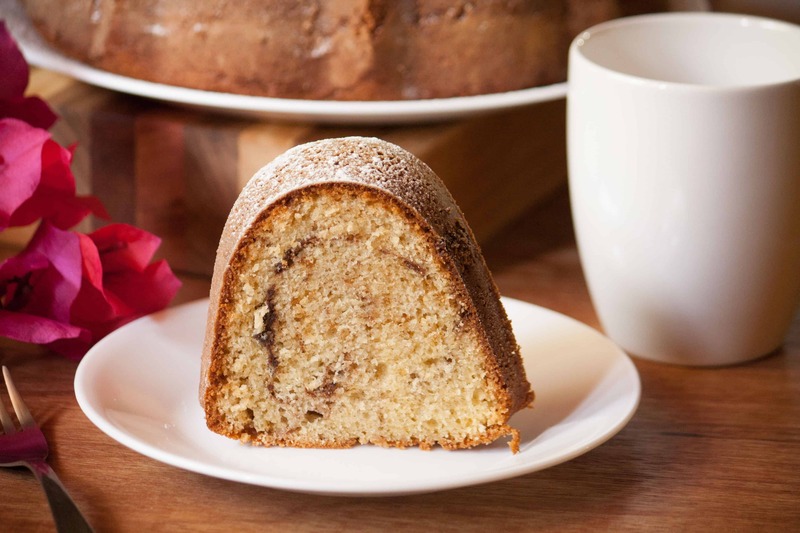 Coffee cake is a simple cake, sometimes with a streusel topping (like this Brown Butter Banana Coffeecake) or some nuts, enjoyed for breakfast or brunch with a cup of coffee or tea. Cinnamon is the star ingredient in this coffee cake. Make sure it smells fresh and hasn’t caught any other flavors over time. In Paraguay, Global Trading has good quality ground cinnamon and in larger quantities than the 100g found in the supermarket. I’ve made this cinnamon coffee cake with butter, margarine and vegetable oil. Each fat gives the crumb a different texture. Try it and see which one you prefer. Butter, eggs, and milk should be removed from the refrigerator 30 minutes before use. Once you have all the ingredients ready, start creaming the butter with the sugar with an electric mixer. Add the eggs one at a time making sure they mix well with the butter. 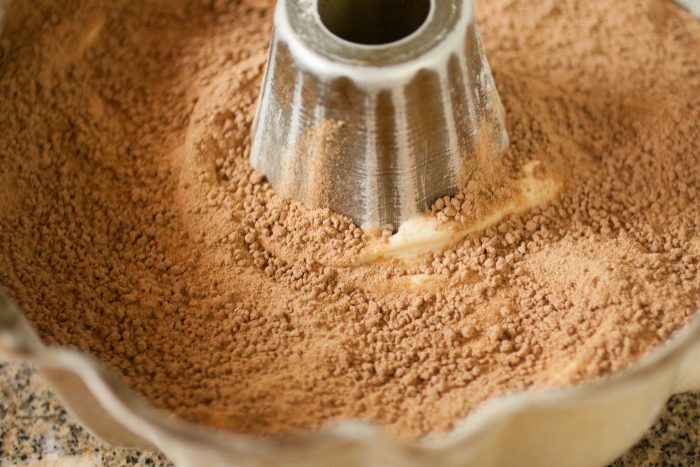 Once mixed, keep beating until you have a very creamy mixture. Once you mix all the ingredients for the batter, add half of it to the pan, sprinkle all of the sugar/cinnamon mixture in a uniform layer. Add the rest of the batter and with the help of a knife start to swirl, trying to mix the cinnamon layer with the rest of the batter. There is a lot of batter in the pan, so it takes about an hour to bake. The oven shouldn’t be too hot. Bake at 350F/180C to have an evenly cooked cake. 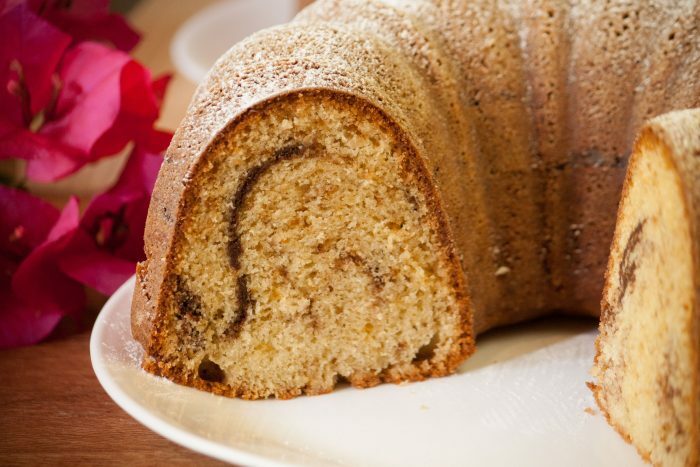 When and how do you eat this cinnamon coffee cake? well, whenever you want to! 😌. This coffee cake goes well either for breakfast or snack with a cup of coffee. I know my mom has served it as a cake for a birthday party, with a delicious vanilla meringue. Preheat the oven to 350F/180C. Butter and flour a bundt cake pan. Mix all the dry ingredients and add to the batter alternately with the milk. Add the vanilla. Pour half into the pan, add the cinnamon/sugar mixture on top, then add the rest of the batter. 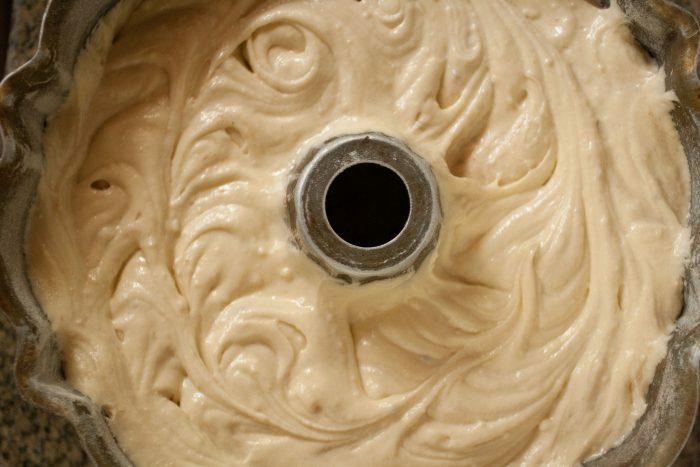 Using a table knife swirl it around and through the batter. Let it cool for 15 minutes before removing from pan. All ingredients should be at room temperature before using. Can’t imagine the taste of combined cinnamon and coffee. I’m pretty sure that it would be awesome. The photos looks delicious and so soft. I’m so excited to try this one. 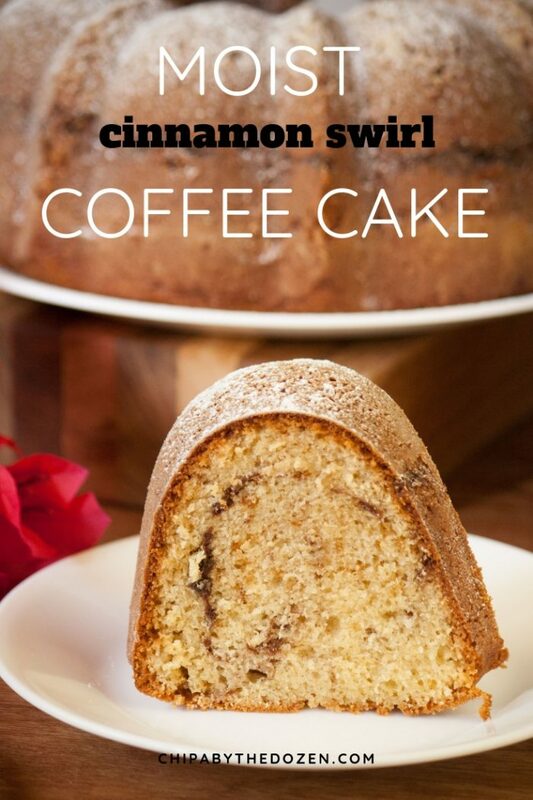 This is the best coffee cake I have seen all year. It looks so delicious, moist, and comforting. 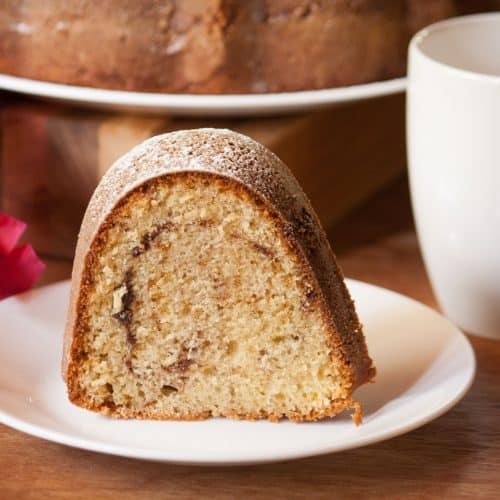 What a delicious coffee cake! It looks absolutely delicious! A great cake for dessert! This is amazing! It reminds me of the coffee cake my grandmother made when I was a little kid. Thank you so much for sharing! This is the kind of cake I dream about! You had me at cinnamon! This looks so delicious! 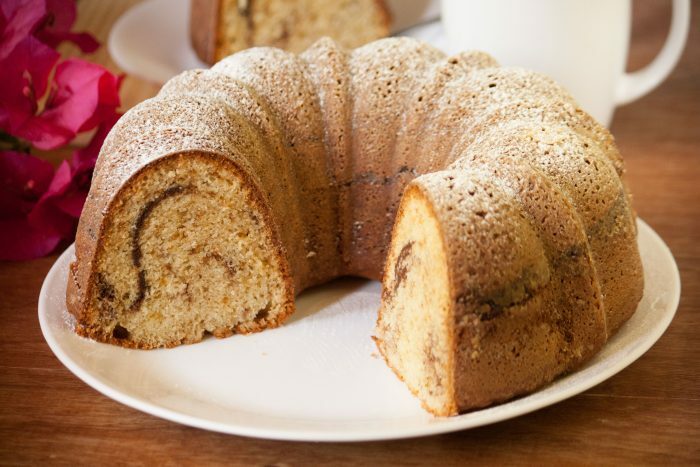 I LOVE coffee cake, it’s truly my guilty pleasure! Yo también estoy haciendo!!! No tenia azúcar morena entonces deje 1/3 de la masa con cacao y hice mármolada! ! 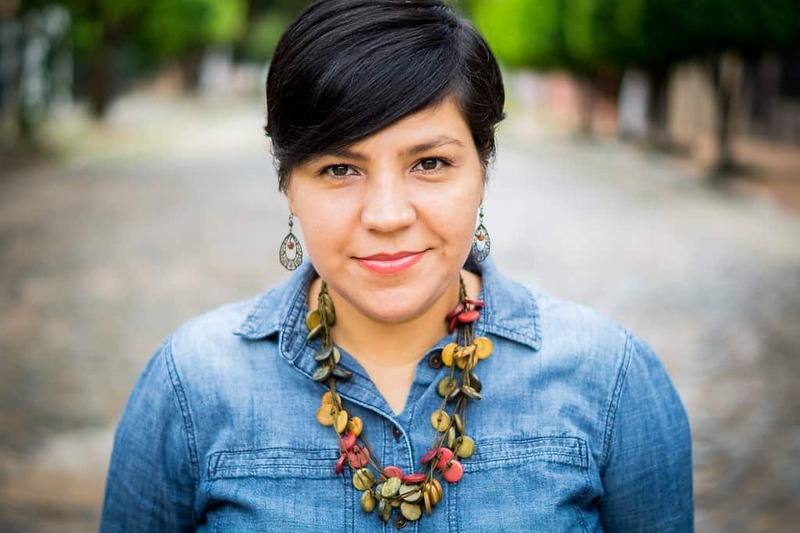 Les cuento después como me va!!! Gracias Lizet! Hoy estoy haciendo de vuelta esta receta,pero como no tenía mas canela,mezclè el azúcar morena con chocolate en polvo, a ver si sabe rico! 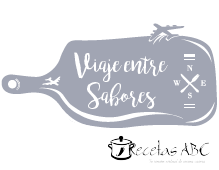 después les cuento! Hoy hice este bizcochuelo! una D E L I C I A!!! Exito total en mi familia, tanto que ya la adopté como acompañamiento del café de los domingos! Como no tenía mantequilla,usé crema ácida y salió deliciosa,húmeda y con un aroma que ni les cuento! Gracias Lizet por tu receta!